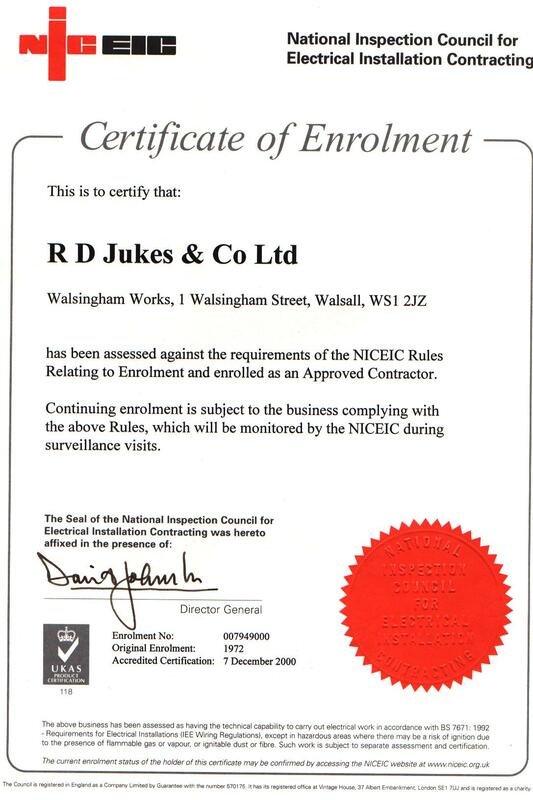 NICEIC Approved Contractor [view] - We are a member of the NICEIC Approved Contractors scheme for Electrical Contractors undertaking design, installation, commissioning and maintenance of electrical installations to the electrical safety standard BS 7671. NICEIC Domestic Installer [view] - In addition to the above NICEIC accreditation, we are also approved under the Domestic Installer scheme, which covers work within the scope of Part P of the Building Regulations. ISO9001 [view] - The quality standard our practices conform to is BS EN ISO 9001:2000, a model for quality assurance in production, installation and servicing. ISO14001 [view] - Our environmental management system is certified to the BS EN ISO 14001:2004 standard, which enables us to formulate a clear policy and objectives to positively influence environmental aspects and impacts. ISO45001 [view] - BS EN ISO 45001:2018 is the internationally recognised occupational health and safety management system standard that we are certified to, which helps us identify all legislative requirements, identify the hazards and control the risks of our work. Peninsula [view] - By working with Peninsula, the UK's leading personnel and employment law firm, we have the framework in place for ensuring that excellence and 'best practice' are achieved throughout the human resource management process. Constructionline [view] - We are a member of ConstructionLine, the UK's register of pre-qualified local and national construction and construction-related suppliers. CHAS [view] - Our certification to the Contractors Health & Safety scheme demonstrates our compliance with and management of current health and safety legislation.